When I first started adventuring in to the world of protein, I actually stuck to my routine of having a protein shake in the morning on my way to work and also whenever I went to the gym at night for quite a while. Rather than water, I used to use either Almond Milk or Hazelnut milk to make them extra delicious, but because I’m lazy and now the colder mornings are setting in, I never really fancy a cold protein shake. I was tempted to get some Hot Protein Latte from MyProtein, but I’ve still got a 2KG bag of regular chocolate to use up first. Whoops. The other week I made some 3 ingredient Protein Balls with nuts, and they went down a storm. This Easy Protein Ball Recipe is very similar to that one, but I’ve tweaked it slightly after discovering that Home Bargains have Chia Seeds for £1.79, so I thought I’d try them instead of the mixed nuts I have made them with before. 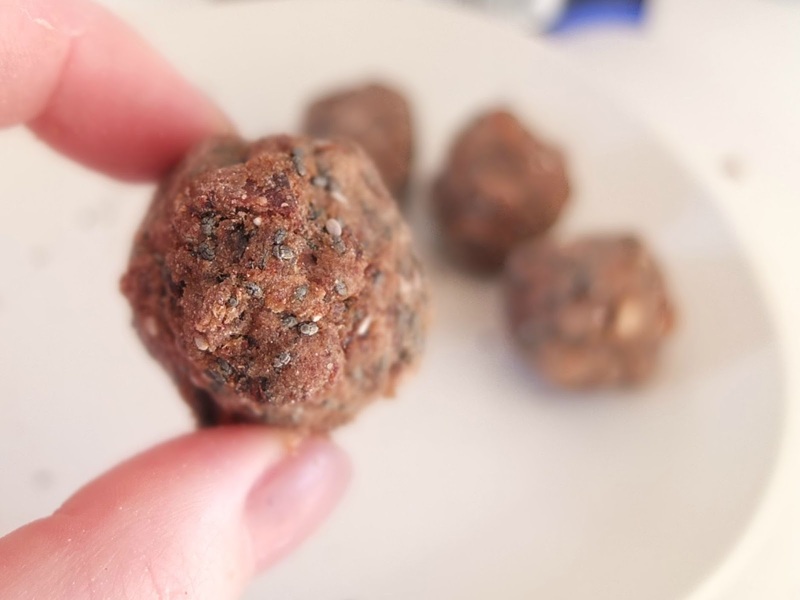 I’ve not had Chia Seeds before, but after everyone raves about their health benefits I thought they’d make a welcome addition to this Protein Ball Recipe. The method is pretty simple. Pop a good serving of the chopped dates in a bowl and pop in the microwave for around 10 seconds. Just slightly warming them through. This ensures that when you add 1-2 tablespoons of your protein powder, the powder has something to stick too. Add about a tablespoon of chia seeds to the mix too. Then you can just use your fingers to rub the mixture together and form the balls. If the dates are too warm to rub through with your hands, just us a fork to mash it all together instead. If you find that the mixture is going slightly too crumbly and won’t hold together, just add a few more dates and warm through again. The warming of the dates just makes them more sticky for the powder to stick too, so it can be a quick case of trial and error to get it right. As long as you have dates left you can play around with the mixture measurements as much as you like really. Just mess around with the ratio of dates to powder until you get a consistency that you like. And that’s about it! Of course, you can play around with adding chocolate chips, different flavour protein and nuts too. Using dates as a base for these balls is pretty much the same as what you find in those terribly overpriced ‘Nakd’ bars, so you’re probably best just mimicking your favourite flavour of those and making it at home instead!